MLNP: MANIC MONDAYS: Hey its 2010... Where are the hover cars? MANIC MONDAYS: Hey its 2010... Where are the hover cars? Hey peeps, The future is now.. or something like that. When I was a kid I thought for sure we would have hover cars and transporters by now. Dont get me wrong Iphones and a Black president are amazing but where is the Jetson's meal machine? Join the MANIC MONDAYS posse for the first party of 2010. 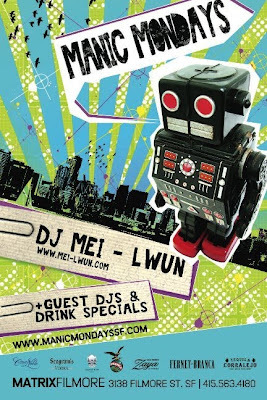 Its a whole new decade ya'll and San Francisco's favorite weekly party will be doing big things with resident and host DJ Me-Lwun & special guest J Espinosa on the ones thru fours!! Drink specials on Fernet and Corralejos so bring your self down early and warm your body by the fire and your soul on the dance floor. Never a cover and always an interesting mixture of music and people. We been spicing up Mondays on a regular for almost two years and its only getting better as we simmer so come add your flavor to the mix. 3138 Fillmore St SF 9pm-2am No Cover. Dress to express! !